What are the Clean Up Procedures? Wash and put away all the dishes, pots and pans and silverware you used, leaving the kitchen clean. Empty the dishwasher. Trash: If you are checking out any day other than Sunday or Monday, please don’t fill all the trash cans as the next guests need room for their trash, too. On Sunday night, bring the trash cans out to the curb, across the street for Monday morning pickup. If you don’t want to do this, please let us know in advance so we can send someone to do it. Before you leave, make sure you have emptied all trash cans (kitchen, bathroom) into the cans in the garage. Other notes: If you accidentally broke something and you booked direct through us it will most likely be covered in our insurance we paid for just for your stay. PLEASE LET US KNOW about broken items, we can’t fix them or replace them if we don’t know and this is not fair for the next renters!!!! If you didn’t book through us, breakage will be covered by your security deposit. All the food and your essential spices and condiments (we provide many spices, but can’t be sure we will have what you want.) Bring cooking oil, coffee, mustard, rice, anything that you plan to cook with or eat. Your personal care products such as soaps, shampoo, lip balm, lotion, shaving cream, razors, bubble bath, etc. Kitchen: Where is the [fill in the blank]? Need to know more about appliances? We are creating and will post videos here soon! 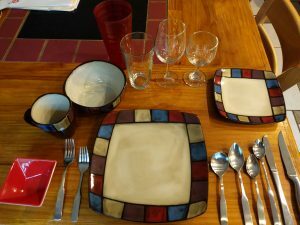 A full place setting should look like this. Why should I book direct? Book with confidence! We provide you, for free, accidental damage insurance covering $500 worth of damage! If you want, you can purchase additional damage protection of another $1000 for only $10! Trip protection insurance! For a nominal cost, you can protect your vacation from cancellation costs due to sickness, injury or death; weather causing delay of travel; auto accidents; job layoffs; trip delays and more! See Insurance for more details. Direct access to the owner! Unlike on the VR marketing sites, booking direct allows you easy access to the property owner (that’s me, Dottie Natal!) You also have access to my email, phone number, and text message number. You also have direct access to my local property manager who can help you with any issues that arise while you are staying. No invited guests without PRIOR written permission. Pets and teenagers must be supervised at all times. No loud music at any time! No trash or food left outside due to raccoons and bears. Clean up before you leave. No tampering with the Video Surveillance system. We may record audiovisual footage from the front of the house (an area in which there is no reasonable expectation of privacy.) There are no cameras inside the home or in the back of the home. Do you have baby/toddler supplies? Please do let us know before your stay if there are additional items you would like to have at the cabin for your little ones. Please wash (disinfect all parts) and store the items before you leave. Update June 4, 2015: we installed brackets for the gates at the top and bottom of the stairs (living room) and on the upstairs back deck. Gates could also be used in any doorway. Probably you understand how to use these better than I do, but they are a bit tricky. Essentially, do this: (1) make sure the lock mechanism is in the “unlock” (up) position, and slide the gate open to the size of the opening. (2) Place it into the brackets (or the doorway) so that it fits, but not too snug (we’ll tighten in the next step.) If you are placing at the top of the stairs, note that we cut a grove/bracket into the wood at the sides, so first line up the top brackets, slide the gate down, then press it forward towards the stairs into the groove. (3) Tighten and lock the gate by pulling the lock lever down into the hole and lock it in place. At this point it would be very difficult for a baby or toddler (or your smart puppy) to open the gate. It is also so tight that it cannot be accidentally knocked over. (The draw back is you have to remove it if you want to use the stairs yourself.) Of course, test the fit when you are done and use common sense; we’re not there so we don’t know if the gate has been damaged in any way that makes it unfit, so it’s on you to check it. Hot water? How many showers/baths? You’ll be happy to hear that the cabin features a “hot water on demand” system, so there is always hot water for everyone! There is a bathtub/shower combo in bathroom 1, a Jacuzzi bath in bathroom 2, a roll-in shower with hand shower head for full handicap access in bathroom 2, a generous size shower in the downstairs hall bathroom, a bathtub/shower unit in the downstairs Master and a 2-person Jacuzzi in that room. The hot water on demand system is configured to make it possible for multiple showers to happen at the same time. Enjoy! Tell me about the meeting room/Queen’s bedroom? The meeting room is downstairs: it about 28 feet by 19 feet. It holds up to 30 people in folding chairs with the tables. If you are planning to have a workshop involving people coming in for the day you must provide that information PRIOR to booking. We provide padded folding chairs and tables. Some tables are individual and some are for two people. The room has a sink and storage and good electrical outlets and lights, so you can do any sort of workshop there, from art, to sewing, to computers. It has two queen beds and two queen futons which can be folded up for meetings. Alternatively the beds can be left up and the tables and chairs set up in the remaining area, which would be sufficient for about 18 people (giving a space of about 20 feet by 19 feet for the group.) 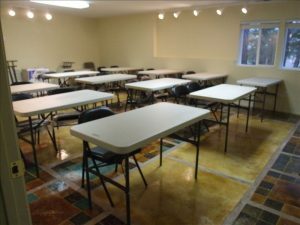 Honestly a lot of our groups that meet there also use the living room for meetings as it will seat about 11 on the seating in there and you can bring in chairs and tables for the remainder, or use the living room and den which are adjacent. 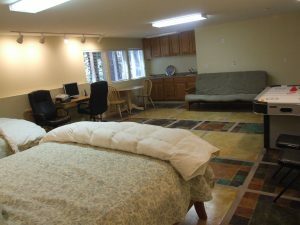 In addition, we have twin air beds, a queen air bed, plus three twin size mattresses in the living room and den that are used as seating but also can be used as sleeping spaces. Ask if you need sheets for any of these as we don’t normally leave them out. There are also two couches which fold down for sleeping. The “man cave” isn’t appropriate for sleeping as there is no window for fire escape. This cabin was designed to accommodate extended family groups and church groups. 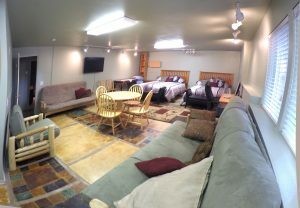 Typically, the bunk room is used to sleep all the “boys” and the Queen’s room the “girls”, with parents in the various master bedrooms. Please look at floorplans for more details on sleeping arrangements. What linens are provided? Towels? Linen service (sheets, pillow cases, towels) is included in the cleaning/linen fee. Your beds will be made up before you arrive, with these exceptions: the queen futons in the Queen’s room, the top bunks in the bunk room, pull out and inflatable beds. Extra sheets are provided for these beds. We don’t make them because hardly anyone staying actually uses those beds, given the large number of other beds, so making them, stripping them and washing the sheets is not very environmental if they don’t get used. There is a washer and dryer here if you want to wash any of the linens while you are staying or need to do a load of dirty towels. No need to wash the linens before you go, that cost was covered in the cleaning/linen fee. You can use the washer/dryer for your own clothing, too, please bring your own laundry detergent. When leaving, please leave any bed you used “turned down” (pull the spreadsheet down.) If you want, you can strip the sheets and pillow cases and put them in the laundry room. Any unused bed can be left made up. Used towels can go into the laundry room, too. Yes, yes, yes!!! We LOVE weddings! Natal Granite Retreat is suitable for a small, intimate wedding party. We have posted pictures of a wedding on the Back Deck page. Looking for things to do? See our Summertime Activities blog post for some ideas!